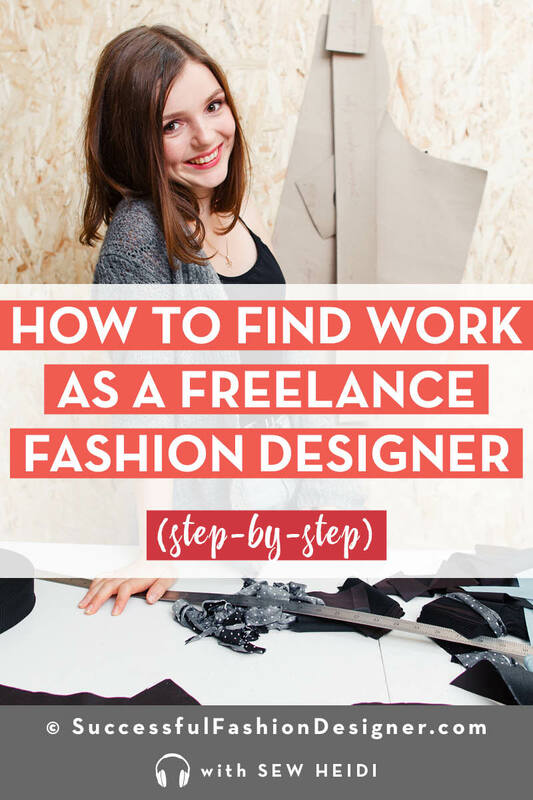 Melissa’s a successful freelance fashion designer – and she’s absolutely killing it. She’s even landing gigs and projects with NYC brands! 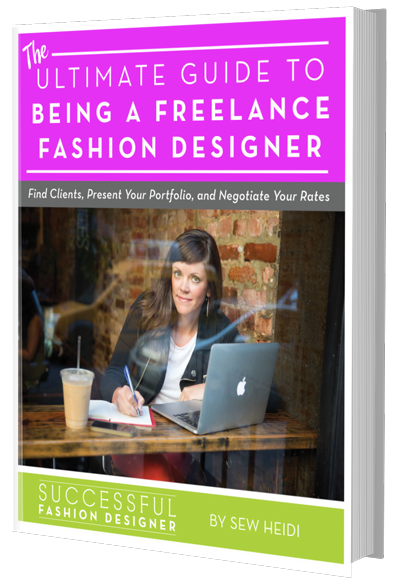 In this episode, she shares word for word email templates of how to get work as a freelance fashion designer and tricks to figure out and negotiate your freelance fashion designer pay rate. But her life wasn’t always this perfect. 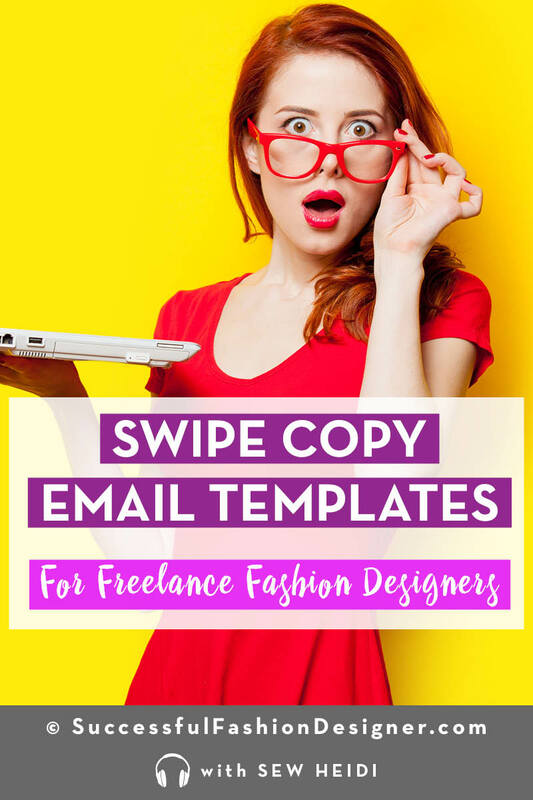 Get Melissa’s freelance fashion designer email pitch template here. Heidi: Hey everybody this is Sew Heidi and you’re listening to the Successful Fashion Designer podcast. We all know this a fashion industry is brutally competitive and it takes loads of hard work to get ahead, the problem is that everyone’s secretive and tight-lipped about their ways. 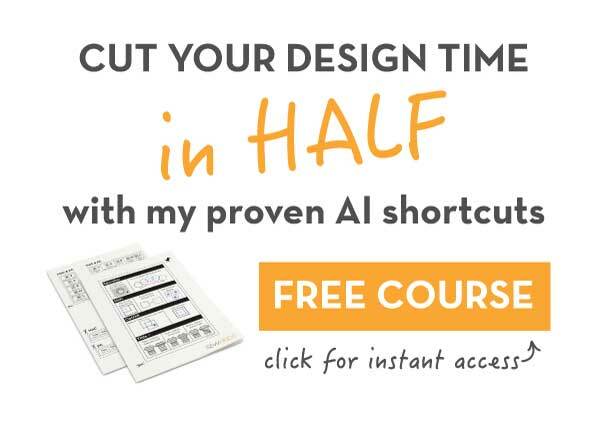 After working as a designer and educator for over a decade I wanted to help break down those barriers and bring you valuable knowledge from industry experts and this show is exactly where you’ll find that, whether you’re trying to break into the fashion world make yourself more marketable launch your own label or become a successful freelancer we’ll help you get ahead in the cutthroat fashion industry. 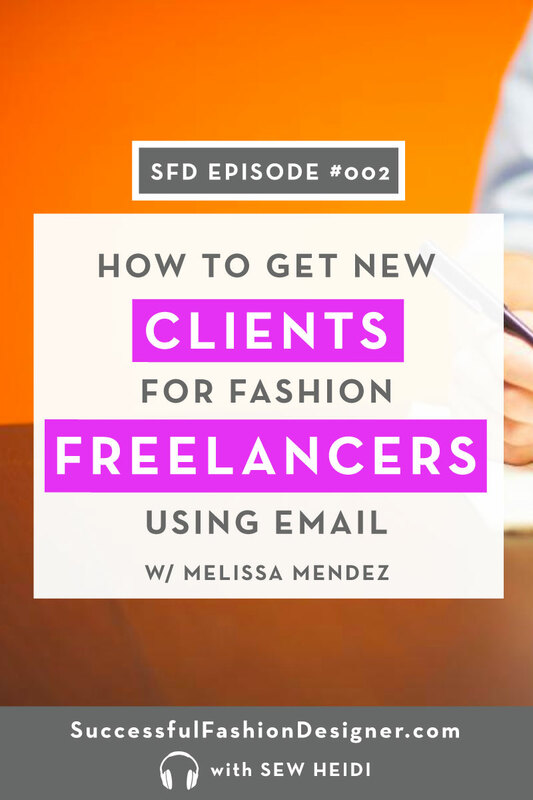 This is episode two the Successful Fashion Designer Podcast and today I’m chatting with Melissa Mendez. After experiencing what she thought was a heart attack while working in the corporate fashion world for over ten years she realized she needed to make a big life change over two years ago. 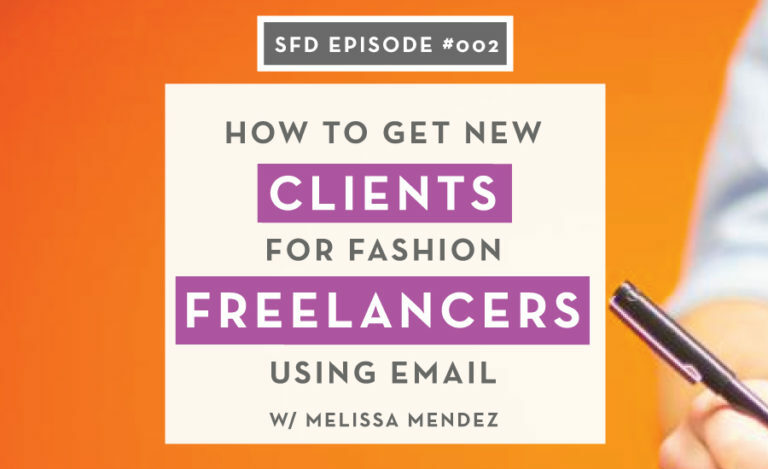 Melissa started freelancing and built her own design agency in this interview she shares how she used her industry network and cold email pitches to get new clients including a $15,000 contract from just one email. She also shares with us the exact email formula she uses to do this. 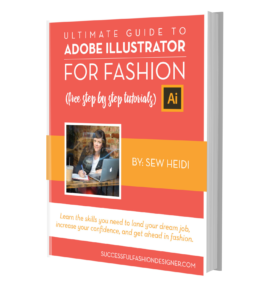 Before we jump into the interview I want to remind you of the free templates tutorials and resources I’ve created to help designers like you get ahead and fashion. You can find all of them on the Successful Fashion Designer network at SFD network.com/free. To access the show notes for today’s episode visit sfdnetwork.com/2. Now onto the interview with Melissa. Welcome to the Successful Fashion Designer podcast, Melissa. Why don’t you start by introducing yourself and letting everybody know a little bit about what you do. Melissa: Cool thank you for having me Heidi my name is Melissa Mendez of Melissa Mendez a Fine Studio and I have been in the apparel industry for over 10 years well in the corporate capacity and I’ve been running my design studio for two and a half years. Heidi: Awesome, so I want to talk, you transitioned from the corporate world to the freelance design studio world working for yourself so I definitely want to dive into that but before we get into that let’s talk a little bit more about the beginning of your career and how you even got started in the first place so you went to F.I.T is that correct? Melissa: Yes I did go to F.I.T and I also studied Fine Arts at Parsons for probably about two years. Heidi: Okay cool and so from F.I.T, what was your transition like from school into the corporate world how did all that go down, how did you land your first job, how did you kind of get your foot in the door somewhere and get started? Melissa: Well, I’m a bit of a Type A personality, semi embarrassed to admit that but F.I.T was like my first choice in schools and when I got accepted I was like I was super excited so I did four years as I studied production management at F.I.T and I think I landed my first job still in school. Yes I graduated and I think like the next week I was working, so much for taking a year off and traveling but yeah, I just went directly into the corporate world and if anybody knows F.I.T they have a great alumni and faculty that really helps you to land your first job awesome. Heidi: Awesome and so it was really through your network and you contacts through the educational infrastructure they’ve got your foot in the door at your first opportunity? Heidi: Okay cool. So you spent 10 years in the corporate world and was that always in one company? Melissa: Oh no, several company. Heidi: Yeah, tell us a little bit about that journey and sort of how you went from one thing to the next throughout those 10 years and what that was like. Melissa: Right, okay so you know as I mentioned I started off why studied in a study production management so my first gig out of college was as an assistant production manager and that lasted all of six months it was a very fast-paced very high-stress position and very different from a school setting and from there I felt like I wanted to be a little bit more creative so I transitioned from being a production manager to a technical designer and I spent probably close to eight years as a TD a technical designer throughout the apparel industry at various companies and dealing with various categories such as children’s apparel, women’s apparel, ready-to-wear cut and sew and even some evening wear as well. Yeah, so basically the idea for me was to climb the corporate ladder and to definitely get as much experience as I could you know amongst the different categories and different businesses companies that were out there. Heidi: So you like in your mind you said I just want to get like a broad experience base within different sectors of I mean you focus on technical design but within different children’s women’s wear you know different product channels and then how did you I mean because one of the things I think can happen really easily is that designers can get very pigeonhole and what they do and so you not only went from okay a study production management and that was my first job and then within six months I decided it wasn’t the best fit for me and you transition in a technical design you then took that and you ran with it working at it in a variety of different brands and like how are you able to say you know what this is not my focus anymore I want to pivot a little bit and how are you able to secure some of those opportunities when maybe that wasn’t exactly what your background was you didn’t have that on your resume you didn’t have any your portfolio? How did you grab some of those opportunities? Melissa: Right, well I would like to say it was a you know one key fits all but it was good old-fashioned hard work and determination and just kind of rolling with the punches you know when you’re at any job or any in any career or you definitely you communicate with other people you speak to your peers you also speak to people who’ve been in the industry for a little bit longer than you have and you get advice you get feedback and you know throughout the years me having a lot of that you know I kind of determined that this is something that you know I can make tweaks here or there and as far as leaving production and going into tech design I think it was really just following my heart and knowing that I wanted to do something a little bit more hands-on even though technical design is very involved with computers and now with the industry moving forward I mean everything is just digital from pattern making to grading I mean everything but at the time, technical design you know you were dealing with materials a little bit more and this was going back 10 years ago well a little bit more than 10 years when I first started you were dealing with patterns I was at you know the pattern maker it’s table with these 60 year old men and women who’ve been doing it for 40 years you know so it was really hands-on and at the time I felt like that was where my heart was me drawing me too yeah so I think I think that’s how I got to that in my career and there was another point that was somewhat of a pivotal moment when I just kind of felt like my heart was calling me to do something bigger and grander and you know just to kind of be more creative I think it was maybe year five I want to say I was working at a children’s apparel company and the amount of I want to say stress and workload and just feeling a bit detached from what I thought that I wanted to do and where I thought my heart was leading me I had a huge anxiety attack and when I say huge I mean like I thought I was having a heart attack and you know I had to go to the hospital and have all these tests run like I couldn’t breathe it was just one of those you know experiences that really kind of like slaps you in the face and says like wake up you know do you want to continue like this. So from having that experience you know that anxiety attack, I started you know really examining myself examining my heart trying to find like a purpose and I know that’s like super cliché but for me it was a reality and something that I still live by another cliché I started doing yoga and meditation and I say that you know jokingly but it really did save my life and you know to this day I still exercise those principles and in my everyday life and with clients but I love fashion I always have loved fashion and I always will I definitely invested a lot of my life in that industry but I think that at that point I was awakened to the fact that I want to use my skills in a different capacity for something a little bit more self fulfilling. Heidi: Which was starting your own design studio and not working in the corporate space, correct? Heidi: …it’s pretty intense it really makes you reevaluate everything that’s going on and so from there like what were the next steps you took to say I want to leave this role in the corporate world it’s not what’s in my heart it’s not meant for me and I want to start moving designs too I wanted something for myself like if I if I but if you’re talking to the listeners out here and there may be this is resonating with them you know they’re stuck in some job that is really not fulfilling for them, they’re like this corporate grind is not for me I want to start freelancing I want to start my own designs to do I want to do something more independent I’m entrepreneurial type a little bit more like what are some of the action steps you took to help you transition from that to this completely different setup? Melissa: …and so that’s how I started and I think I spent like $200 on my website and all of that and from there I just started getting more clients and that’s how my design studio was born like literally from that email. Heidi: So wait, how did she find you? You said you didn’t have a website or no social media like it sounds like it kind of literally fell in your lap but it can’t, how did she get in touch with you? Melissa: She found me through LinkedIn. Heidi: So yeah, your profile updated with all your experience and somehow she tripped over that and sent you a contact and that was it. Heidi: To be home with him more. Heidi: Okay, so you got your first client through LinkedIn and then that was this I mean that was like an amazing win right at the very beginning and then from there you still invested and put up a website and from their how did you grow? How did you get more clients? I mean okay you had your website set up but then logistically like what you know it’s nowadays it’s like okay I can spend $12 a month on Squarespace and throw up a website for people to find it for people to inquire through that you know it doesn’t necessarily happen super organically so how have you strategized growing that portion of your business getting more clients to your website, getting more enquiries for work landing more contracts? Melissa: Right, so during that class that I was taking I met a woman who she worked exclusively in the freelance world and I’m like how are you eating dude like for oh this is New York City they think how are you living I was so curious so she you know I guess advised me or put me through you know this like networking saying that she was doing which is basically like going to events telling people what you do getting their contact information and then you know seeing if it’s a right fit to work with them. So initially that’s how I got clients do that like you know old-fashioned networking word-of-mouth contacting people that I had known in the industry like hey like this is what I’m doing do you know anybody who needs these services you know a technical design you know print surface design and also coaching for startup apparel companies. So from there I got you know my first little clients and I was still freelancing at the time so I want to you know say that because you know it was definitely a process to build up the clientele that I have now. So I actually freelance for about seven months to a year the first year of my design studio while I worked on you know developing a pitch I worked on my email marketing you know specifically targeting companies that I felt like was a good fit for what I was doing. So I have extensive background in children’s apparel and women’s apparel so I targeted companies that was like in that space and my business grew from email marketing and that’s how I sustained it today I have some referrals and also email marketing. Heidi: Okay cool. So I want to back up really quickly just to clarify because depending on what industry people work in or depending on what geographic location you’re in the term freelancing can mean very different things but in New York in the fashion industry it means something pretty specific so tell us tell us what that means because on one level you could say I’m freelancing which to some listeners might sound like I’m working with clients I’m totally doing my own thing versus in the New York fashion scene saying I’m a freelancer is a totally different thing. Melissa: Right, so when I say freelance in New York City I’m referring to you know going into the office Monday through Friday most of the time from 9 to 5 or 6 or 7 or 10 or midnight and basically working as a support role for that business so like if so if I were to freelance today as a technical designer they want me to come in at this time at that time and basically support the current technical designers who are full-time there. So you’re going into an office on a full-time like 40 hour a week type of a situation more or less and you’re not really how do I say you’re not really like oh I’m going in for two-hour meeting here or there like that’s not for me that’s like being a consultant you know so yeah I mean I hope that that kind of clarifies the difference between a freelancer in New York you’re still working at 40 hours a week but you’re more of a supportive role within that company you’re not getting any benefits right you’re probably making a higher dollar amount per hour but then again you’re not getting any benefits or any vacation or anything like that and usually it’s within like I mean I’ve been freelance like three or four months at a time but some people I know have done it for six eight months a year you know so it really just depends on the company where they’re at their business structure and how long you feel comfortable working you know with that company. Some other companies let you work like three or four days you know in the office and like one or two days remote whatever you know so really just depends. 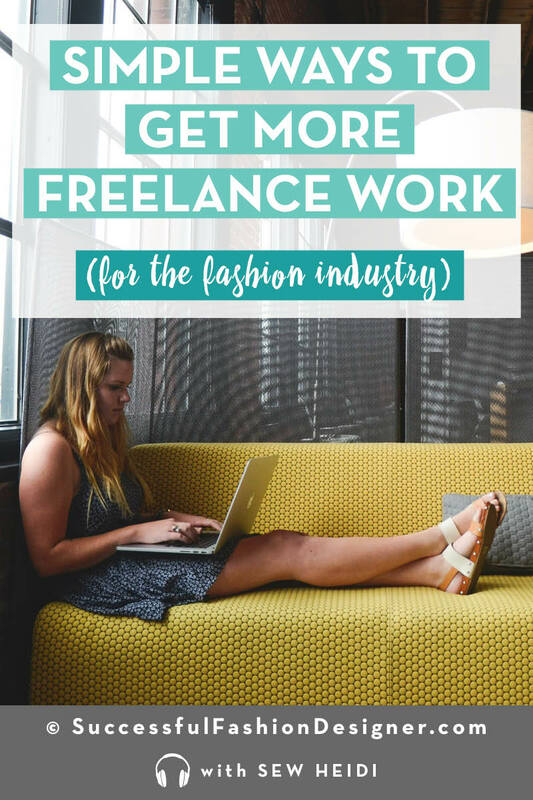 Heidi: Okay, so you’re freelancing which is essentially like a full-time job but you’re not getting any benefit so you’re still like physically occupied 40 plus hours a week but you have a base income for that which is helping with stability and in this on the side of that you’re starting to grow you’re other business and land your own clients which are more under this like an agency umbrella that you’ve started and you mentioned I mean you mentioned a couple things like you’re just kind of you went out to events and you talked to people and you met people and you let them know what you were doing and you make context that way and you utilized all the resources that you had within your network to reach out and say “hey this is what I’m doing do you know anyone that needs to be work done” and that built up a little bit of a base and from there you said you started doing some email marketing so talk a little bit about that because it’s definitely a very powerful tool but I think one that is overlooked amongst designers who want to get out and go on their own. Heidi: Yeah tell us about how you how you started that and what are some of the strategies you’ve used to use that tool to help grow your business? Heidi: Sure. Share with us. Melisa: Pat Flynn, Smart Passive Income Jeremy and Jason from Internet Business Mastery. I also listen to my leaked heal from cora box she’s the founder of cora box I mean Gary Vee you know like there’s so many people that are just going create like they’re just doing amazing right now and so I would say probably more from Pat Flynn and Jeremy and Jason from Internet Business Mastery they really like their interviews the people that they were interviewing on their podcasts they were just like email marketing, email marketing, email marketing and I’m just like why would I randomly email somebody you know and say well I offer the service and you know do you need it and this is how much it charged but there are ways that you can do that skillfully and with finesse and not make it like super cold call you know like that type of thing so what I did was you know I obviously did a few drafts a few iterations and really designed a pitch around who I wanted to work with and just shared with them my experience in the industry why I you know went out on my own and what services I could potentially provide to their business if they were interested. So I crafted this pitch and I you know research some companies that I thought were interesting and then I just sent him an email. So part of that was becoming educated from podcasts, a part of that might be me being a New Yorker and just being like well what am I gonna lose they’re just not gonna open up the email and you know call it a day one you know and I think another part of that was just being bold and brave you know sometimes when you start a business you don’t know if it’s gonna succeed this is actually my second business. My first business was a soy candle company which I kind of did like on a part-time basis throughout my career in corporate apparel, corporate fashion and I learned a lot of lessons from that business. I also learned when to let things go, when to yeah which is a beautiful lesson like I feel like everyone is so afraid oh my God my business doesn’t succeed like I’m a failure this is the worst thing ever, no, it really like if you fail at something that’s the best lesson and it’s so humbling and for me it just taught me to just strive for higher things for better things to make improvements when I need it to and actually my candle business was doing very well and it was not you know I guess failing by you know what people might consider failing I was bringing income but I think that one of the things that stopped me from continuing on was when I got pregnant you know I just knew that I didn’t want to continue making the candles and going to the trade shows and all of that so that kind of played a huge part and then I guess the call of fashion or that side of me was still very much alive. So I just you know decided to start my design studio but definitely what I would say to anyone out there who has either had a business or is wanting to start a business just do it you know, just do it might fail I know this is like clichéd I mean this is not you know cliché but this is taboo to say you know start something but it might fail but if you think about it we all start things that have the potential to fail whether it’s a relationship marriage whether you’re gonna start our meal tonight you don’t know if you’re gonna burn that meal but you’re gonna cook it right you know I just go ahead and get it done and and hope for the best and then do the course correction you know as you see fit and that’s pretty much how I live my life I work hard I do I need to do I’ve become educated, I talk to people you know all that jazz and I make course corrections when I need to and I don’t think twice about it because I’m human I’m not perfect and nobody is but there are so many imperfect people out here crushing it so why can’t I.
Heidi: That’s great! I love your attitude, it’s great. I actually have a quote on like one as a sticker on my computer says “doubt kills more dreams than failure ever will” and speaking of yoga, I also have a big yogi but nice my one of my yoga teachers said that in class it really resonated with me and it’s you know doubting that you could do something and not doing it is definitely gonna kill the dream but failing is not gonna kill it just means like you said you have to course-correct you to figure out why didn’t that work how can I do a better different next time to figure out a way that works. Heidi: I love if you could share some of that I don’t know if you have if you could talk about off the top your head right now or if you wanted we can just share it in the show notes. Heidi: Oh my god, that’s amazing. Melissa: Yeah you know so this stuff works and you know just be confident in who you are we all face like that imposter syndrome and oh my god like I may not be good enough or whatever but what I like to say is you know definitely rise to the occasion if you don’t know something you know seek advice like if you know someone else in the industry that might know that thing call them up send them an email like don’t be too you know prideful whatever it’s to ask questions and you’ll knock that project out of the park. Heidi: I love that. A couple of things that you said that are just awesome, is well first of all is the realization that maybe only out of those 20 pitches you send out you could land one and that’s amazing you don’t need 15 of them, you don’t need a really high conversion rate, you know maybe you do get three out of twenty or five out of twenty but sometimes just that one is what you need right in that moment and that’s phenomenal congratulations on that huge success with that big contract. Heidi: …you know but that’s not the case, it’s another crazy industry and there’s so many different aspects that if you don’t know how to do it be humble and it’s okay go out and ask how to do it even it out. Melissa: I definitely agree with that. One thing that I would add like I probably two things so for me I like to surround myself with people who are just like who are nice people you know what I mean you know I think that’s definitely key to surround yourself with people who don’t make you feel like an idiot you know because we all experience times that you know we don’t know something so that’s like definitely a huge factor in my life that I that I use on every scale whether it’s in my personal life and also in my professional business life. Another thing when it comes to asking questions I think that sometimes it’s not about you asking the question that makes like you know people feel or me or you feel uncomfortable but it’s the way you ask it so when I ask a question I generally start off by saying like I’m trying to think of an example that will be clear, all right so let’s talk about like a hip curve right it’s like super long thin skinny so you have a yardstick here and you have a hip curve and you don’t know which one is which so what I would say if I if I’m going to and this is like totally Elementary like fashion 101 but if I didn’t know the difference I would go to someone who’s senior to me right I would bring both of them with me and I would say “gee, I’m wondering which one is the hip curve” I know that it’s long it’s thin but I can’t quite remember which one it is at the point at the time so then they would point to either the hip curve or the yardstick most likely they’ll point to the actual hip curve unless they’re playing games with you which does not do that but the point is that I would come prepared right I would have the actual hip curve in my hands and the yardstick I would express that I understand some portion of it which is that a hip curve is actually long and thin right so you have the two things right there in front of you and then I would then ask the question which one is it so that’s me coming into it with some type of knowledge of what I want to kind of get out of the situation, I’m not just like coming with a tape measure like “Oh what does a hip curve look like and what do you use it for” like you know I thank you how you position a question definitely tells that person who you’re asking that you have some knowledge about it that you are you know you how do I put it you’re not just like all willy-nilly about it if that makes any sense at all. Heidi: …and you presented it to them and you showed listen I’ve spent a little time on this and obviously with your example you could have googled it and you could have gotten an answer but if it were something a little bit more like of a subjective type of question that you really couldn’t maybe find the answer on the internet or you found mixed reviews but you could go to them and say you know what I did some research on this and I read a little bit some people are saying this and some people are saying that and I’m just curious like in your experience what is the best route to go because then it shows you put some effort in and that’s right it’s a two-way street when you’re trying to learn for it and super a two-way street when you’re working with your client like you’re there to serve your client and you can’t approach them blindly like you have to approach them like you said when you sent out these pitches you research the brand and even if it’s only for two weeks and there are new brand to you you’re honest and humble about that but you do enough research that you can talk to them in a tone and talk about things that are relevant to them that makes sense and it shows that you’re not just sending this blind pitch out to everybody. Melissa: Right, absolutely 100%. I do know people who do send blind pitches out and that’s a whole another approach with a definitely a lower conversion rate but I think that as a start-up business or even a business that’s been around for a little while it’s definitely important to try out both and see what works for you at one at what periods. Melissa: I know that you know the apparel industry definitely has you know ebbs and flows you know especially with the development calendar production and like all of that so if you’re in it for a little bit you can kind of gauge when certain companies might need certain services so like if I’m pitching someone for my design studio for the you know my textiles and prints and things like that I would pitch them at a different time of year versus when I would pitch them for my technical design services because you know design and development come way before actually creating that tech pack breaking down how to you know how to make a garment what are the specs you know construction all that and then the production. So strategy information you know knowledge definitely do your research it goes far and going back to you know asking questions I think when you approach someone in that way you don’t feel like you don’t like you don’t feel inadequate at that point you feel like I did this I did my research and now I’m going to ask for a little bit more help and that’s okay. Heidi: …it goes so far in whatever you’re doing when you’re trying to approach someone cold meaning you don’t have a prior relationship you didn’t get an introduction, so I love that. So I want to go back to and I mean you have that one email you sent out what roughly 20 pitches you got you closed one deal for $15,000 and you don’t have to talk specific numbers but like how do you price your projects do you charge by the hour? Do you charge by project? Does it depend? because this is a question a lot of designers have right I think most designers and most designers that I’ve talked to in this space tend to under charge. Heidi: So talk to us a little bit about your pricing structure and strategy and how that works for you? Melissa: Okay sure. Well, when I first started out I definitely charge hourly because I didn’t really know what to charge. What I went off of which was the standard it was the standard New York City freelance rate per hour that’s what I generally charged now I charge things well depending it really does depend on the project. I charge per project so I get details from you know my client what is it that they’re asking for so for instance if they need help with twenty silhouettes I’m not gonna charge them the same price as someone who needs 40 silhouettes so I need to get a project breakdown first before I quote them, so that’s one way. Another way I do still charge hourly and I know some people were like oh my god why but no this is this is the thing I’ve learned my lesson if I if I charge hourly which is a rare occasion I have a base set of hours that I’m working so if I’m just gonna throw a random number out here it’s not what I charge but let’s say I charged you know seventy dollars per hour my minimum you know in a hypothetical world be 10 hours or 20 hours you know whatever so they know going into this project that I’m not going to get paid for less than 10 hours or 20 hours whatever the agreement is based off of what they want so that sets a base price for me and even if I do work like let’s just go off of you know the 10 hour thing if I work seven hours you’re gonna be charged for ten hours that’s just the understanding that we have now that I’m a little bit more experienced I mean I do get I wouldn’t say that one glove fits all and I don’t want to give that give that impression at all because especially starting out like you know you want to get gigs where you can and I do think it’s important to get different types of clients and projects because you really start to develop an understanding of who you want to work with, how you like to work you know what are you comfortable with charging you know and that could be based off of your location if you live in New York obviously you’re gonna charge more than if you live in maybe Florida or something like that where the cost of living is not that is not as much as New York and also most of the times clients are not going to be willing to pay New York prices that’s just a reality of the situation. You know so definitely get your experience you know start off with the hourly see if that works for you I would recommend if you do hourly to have a base set of hours 5 hours, 10 hours, 20 hours whatever it is you feel comfortable with based off of that project and then once you kind of get into the flow of things you develop an understanding of how long it takes you to do this, how long it takes you to do that and then you can create packages around that you know if you’re going to be traveling on-site to some meetings you might want to throw in a few you know I mean extra you might want to invoice for that so it really does depend on your situation it’s not a you know one glove fits all. I still do hourly and I also do project based as well. Melissa: …because if you’re like charging $60 an hour and you’re like you know super fast at drawing cads then you’re really cheating yourself at the end so that’s what I mean when I say it’s definitely a case by case based off of your level of experience and you know whatever the project is the details of the actual project. Heidi: …I agree with you and I tend to go more project-based as well because of those reasons. That is awesome, so many actionable steps here and I’m really excited to check out the email template that you’re so generously willing to share with everybody so that will definitely be in the show notes as well as links to the podcast and your website and all that stuff. I want to close with the question I asked everybody at the end and it tends to stump people so feel free to think about it for a second but what is one question that you always wish people would ask you about working in the fashion industry but never do ask? Melissa: Awesome, well that’s a great question. So one of my more recent coaching clients so you know I’m working with this startup apparel company and they are looking to develop their line they have no fashion experience whatsoever and one of the one of the things that they always think like you said is that I am in stilettos everyday all day running around this city with my latte in my hand you know full face makeup all this Chanel perfume and sometimes that happens I will say sometimes that happens but 90% of the time I am in my PJ’s at home with milk for my stomach all over right and it’s very technical I am on the computer a lot whether it’s creating you know technical packages tech packs specs you know working on a computer system with grading whether it’s doing CAD’s it’s very its work let me just say it’s work . I go to fashion shows not a lot a lot of people are like oh do you got a fashion show like every season and no I don’t I go but not every season and not you know it it’s just a lot of work but if you if you love it it’ll be the right work for you and one thing I tell all of my coaching clients is that you gotta put the work in like nothing is gonna fall from the sky and you will have your glamorous moments and that’s fun you know just like sometimes you’ll see on Instagram someone’s like on the beach and you know with the margarita that’s fine but is that their everyday life, No. So definitely being a realist I think that that gets you through the some that the challenging times like dealing with your bookkeeper and your accountant and getting taxes out and all those things so I mean I hope that like answers your question like I guess what I would say is that you know someone were to ask me is fashion how it looks on TV or something like that I would just say no. Heidi: Yeah I love, I got such a great visual of you running around the city in your stilettos with your latte. Melissa: Yeah it happens but not frequently and my feet kill me after that like oh my god why I do that. Heidi: Okay Melissa this has been so great I’m so tell everybody where can people find you? Melissa: Awesome. Well they can find me online at melissamendezdesignstudio.com. I also have a podcast that I started recently which is called womencraftingsuccess.com where you know women entrepreneurs from all different backgrounds can come and gather around and just get information on a in a way and in a language that women understand. Heidi: That’s great I’ll definitely put links to both of those in their show notes as well. Heidi: All right, so I’m and then to just wrap it up is there anything else you’re working on that you’d like to share with everybody? Melissa: Yeah awesome, well I am working on coaching startup apparel companies through my design studio I’ve worked with a lot of corporate clients but in a different setting me being a consultant and some startup companies and what I really learned is that there are a lot of small brands out there that don’t know where to start, they have no idea about the apparel industry they’re really hungry for advice. So I have kind of expanded my brand to helping individuals who are looking to start women’s apparel, children’s apparel and just need knowledge about it and so you could just head to my website and check that out perhaps you can schedule a quick 15 minute chat and see if we’re a right fit for each other or just kind of hang out. Heidi: …and you have such a great breadth of skill and experience in that. So yes, everybody again that link to Melissa’s site where you can find out more about who she is what she’s doing and how she can help you will be in the show notes melissamendezdesignstudio.com. Thank you so much Melissa for chatting today this has been phenomenal and such a great treat having you on and thanks for sharing all the awesome insights all everybody – to take away and implement in their own careers. Melissa: Awesome thank you so much Heidi for having me it’s been a pleasure. Heidi: Thank you for listening to episode 2 of the Successful Fashion Designer podcast if you’d like to learn more about any of the resources mentioned in this episode visit the show notes at sfdnetwork.com/2 – and since you made it this far you must have liked the episode if you can take sixty seconds to leave a review on iTunes it helps the show a lot and makes the podcast easier for people to discover it’s super easy to do and I’d really appreciate it visit sfdnetwork.com/review to leave your rating and thanks for your support and help.